We should all be thinking about how augmented reality and virtual reality applications will affect our business. This is a handy list of some of the leaders in the space. Augmented reality and virtual reality (AR/VR) are poised to be one of the next largest consumer electronics verticals. 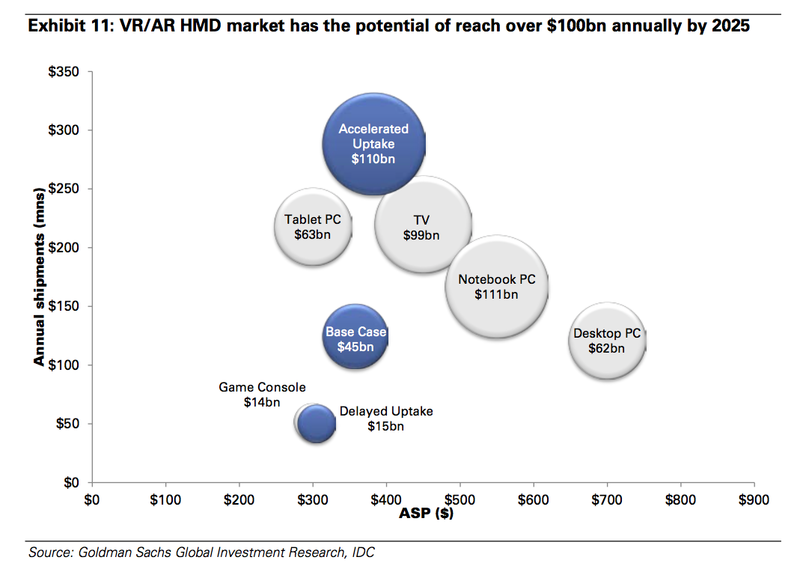 By one Goldman Sachs estimate, AR/VR has the potential to surpass the TV market in annual revenue by 2025, which would make AR/VR bigger than TV in less than 10 years. And in 2015 alone, AR/VR startups raised a total of $658M in equity financing across 126 deals. While AR/VR startups continue to garner a lot of media headlines and hype, the industry is still very much in its infancy, with nearly 75% of all deals coming at the early-stage (Angel – Series A) in 2015. Read the post on CB Insights. Like any large organization, Google has competing bureaucracies and therefore its wholly-owned subsidiary YouTube does as well. (Google is now the largest media company in the world.) YouTube’s organizational independence is additionally blurred because it is the #2 producer of revenue inside Google relative to search and advertising sales. There seems to be a three-legged stool of competing interests in dealing with YouTube which we can describe with generalized labels–the “engineers”, the “policy people” (essentially Fred Von Lohmann) who are mostly lobbyists and lawyers, and the “business people” starting with Robert Kyncl at least at the moment. It’s unclear who has the upper hand in this triumvirate, but it’s pretty clear that the business people do not control their destiny. We sometimes forget that YouTube is the largest video search engine in the world. Once the European Commission gets through fining Google for predatory business practices with Google search, and finishes up the Commission’s separate prosecution of Google for predatory business practices with Android, the Commission may then have the appetite to bring a case against Google for some of the same predatory practices as applied to YouTube. I’m going to guess that Google’s dominance of video search is likely equal to or in excess of its dominant position in organic search and mobile meaning the EC’s scrutiny will be quite enhanced and (by that time) educated in Big Google’s ways. Why it is that YouTube has such little clout internally is anyone’s guess. My bet is that if YouTube didn’t have to check with a host of bureaucrats at Big Google, it would be much, much easier to do business with YouTube. What’s obvious is that the engineers and policy people do not understand a fundamental point about dealing with the creative community. They are every bit as much of ambassadors to the creative community–the entire creative community, not just the YouTubers who essentially are entirely dependent on YouTube for their success–as are the creative people or marketing folk at YouTube. To state the obvious, unlike the YouTube lottery winners, professional artists who are not dependent on YouTube are not dependent on YouTube. If pushed, there very well may come a day that they move on. En masse. That may happen sooner than you might think, despite YouTube’s monopoly on video search. YouTube is currently taking a beating from artists and songwriters. Note that the beating is administered to YouTube–not to the engineers and the policy people at Big Google. Or not yet, anyway. Most professional creators don’t know these bureaucrats exist. Those bureaucrats at Big Google are largely faceless (with the exception of Fred Von Lohmann) and take no heat when YouTube gets roasted alive by key opinion makers in the music business (such as Irving Azoff). To see where this goes, we need only look to Pandora’s experiences with this kind of response to the Internet Radio Fairness Act of 2012. Pandora is still digging out of that hole some four years later. I seriously doubt that the day to day business people at Pandora wanted to go through this misstep, and the stockholders definitely did not. IRFA sprang from the intellectual loins of Pandora’s “policy people” by all accounts, and the business people apparently didn’t really have much to say about it. So how could we repair the problems with YouTube? I think that it’s going to be a heavy lift, but it would start with Big Google telling their engineers and policy types to back off. Then we’d at least have an idea of whether YouTube can ever be a good partner. I suspect we could have at least much better relations with an independent YouTube. Google may be willing to bet that they can outspend and out lobby the creative community. I don’t know as I’d take that bet. While the government has had their boot on the throat of creators in the form of compulsory licenses, consent decrees, and the very unpopular DMCA safe harbors, they can’t make creators happy about it. YouTube should try to shake off the control of their internal masters at Google. Then at least we’d know who we are dealing with. Actually, $2 billion is cool. ASCAP has hit over $1 billion in worldwide gross revenue for 2015, the second year in a row ASCAP exceed the $1 billion mark. US gross came in at an all-time high of $716.8 million, and US royalty distributions to ASCAP members were up 6.2% year over year to $573.5 million, also a record high. It’s particularly remarkable that ASCAP was able to deliver these returns to songwriters and publishers when PROs are hobbled by the near-compulsory licenses in the antediluvian consent decrees imposed on songwriters by the US government. Given the expense of herding sheep, also known as the rate court cottage industry that drives rates in a race to the bottom and expenses up through the roof, this is quite a remarkable accomplishment. Not to mention the cost of hand holding the U.S. Department of Justice. Songwriters with ex-US activity often get whipsawed by exchange rates when the dollar is strong, which isn’t something most people think about. Given that ex-US collections were off for this and other reasons, it’s particularly comforting that ASCAP was able to offset those declines with an increase in US revenue. For more on the consent decrees, listen to Larry Miller’s Musinomics podcast “Songwriters, Consent and the Age of Discontent“.